Heat the olive oil in a medium saucepan over medium heat add the onion salt and a few turns of black pepper. Sauté until the onion is caramelized about 15 minutes. 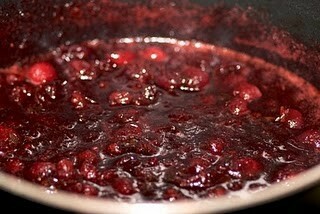 Add cranberries, brown sugar, balsamic vinegar and orange juice. Bring to a boil then reduce to a simmer. Cook until the sauce is jam-like in consistency, about 40 minutes stirring occasionally. Cool then transfer to a container, cover and refrigerate up to one week.